VocApp is a free service for creating and studying multimedia flashcards. You can use VocApp in your web browser or in their free iPad and Android apps. The purpose of the service is to help students learn a new language. To create flashcards on VocApp you need to create an account and sign-in. 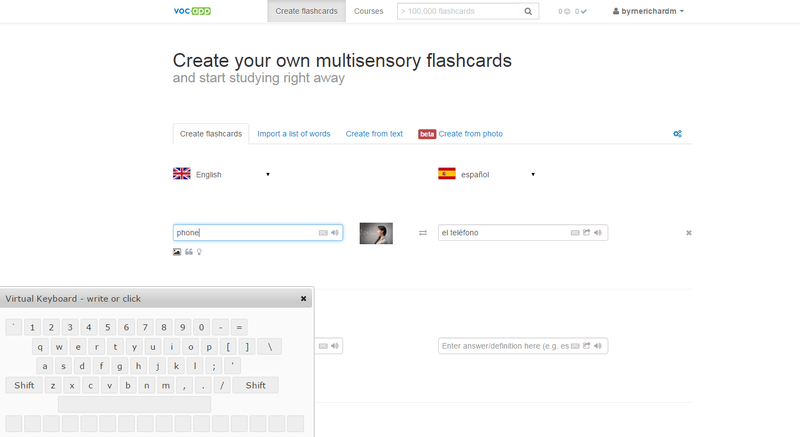 Once you're signed-in you can click "create flashcards" and begin writing out a list of words. Choose the language that you want to learn and VocApp will automatically translate words from English to the language you've selected. On the flashcard creation screen you can add an image to represent the words you're entering into your flashcards. The case of common words, VocApp will automatically add images to your flashcards. To help students learn how to pronounce words, VocApp offers audio support. VocApp does offer some pre-made flashcard sets for sale, but you don't have to purchase anything in order to use the service to create and study your own flashcards. There is also a large gallery of public flashcards created by other users and made available for free. 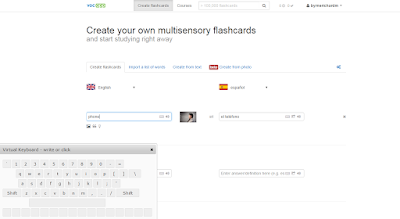 There is certainly not a shortage of flashcard services on the web. That doesn't mean we should ignore it when a new one comes around. I like to give students a few options and let them choose. Some students may prefer the interface of VocApp over that of similar services. The ability to use VocApp in a web browser as well as on an Android tablet or iPad makes it a good option for BYOD settings.